Some new privacy options have been added for teams that wish to shield their players from being compared against other teammates. By default, all team members can see their stats as well as the stats of other players for that team. Player's names are linked to their individual stats page on both the roster and the team stats pages. 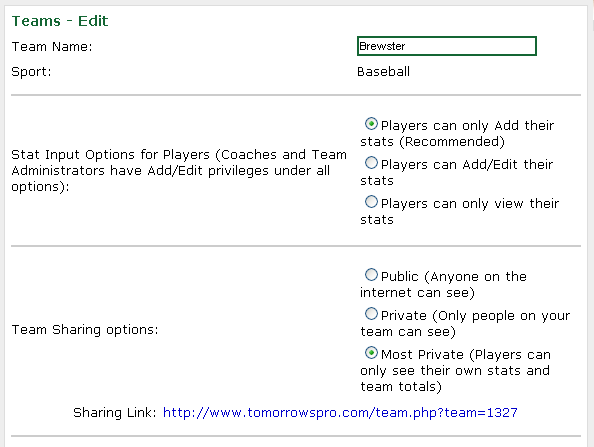 This new privacy option is called "Most Private" and it can be changed on the "Edit Team" page. The "Most Private" option will remove all references to other player's stats. For other players "Team Stats" page will go from looking like the first image below, to looking like the second image below. Administrators, Coaches, and Assistant will continue to see the "Team Stats" page as usual.